Congratulations on your approval for HomeAdvance, the only program that will pre-pay for smart upgrades that reduce your home energy use. Brought to you by Sealed and the New York Green Bank, hundreds of New York homeowners have chosen HomeAdvance to upgrade their homes. Getting started with HomeAdvance is an easy 5-step process to achieve a comfortable, healthy home with state-of-the-art equipment with no change to your budget. After we process your application, you will receive an email from your HomeAdvance Specialist welcoming you to the program. If you’re reading this, you’ve already completed this step! You will receive your HomeAdvance Agreement within one week of your program approval. Learn more about what's in your agreement. Your HomeAdvance specialist will walk you through the details of the program and the terms of your Agreement. Haven't scheduled your welcome call yet? Schedule it now. Your Home Energy Professional will install your upgrades. After your upgrades are installed, you will need to sign a form to verify they were installed. You will receive your first HomeAdvance bill after your upgrades are installed. Each HomeAdvance bill will report your energy savings, providing you an ongoing record of your project's performance. Here are some of the most frequently asked questions about HomeAdvance. You also call HomeAdvance directly to get more information. We're at (888) 650-3715 during regular business hours. How do you figure out how much I'm saving? How long is my HomeAdvance program term? What if I want to leave early? What if I move? What does my Agreement contain? HomeAdvance calculates exactly how much money you’re wasting, and then pre-pays for smart upgrades like air sealing, insulation, wireless technology, and oil-to-gas conversions. 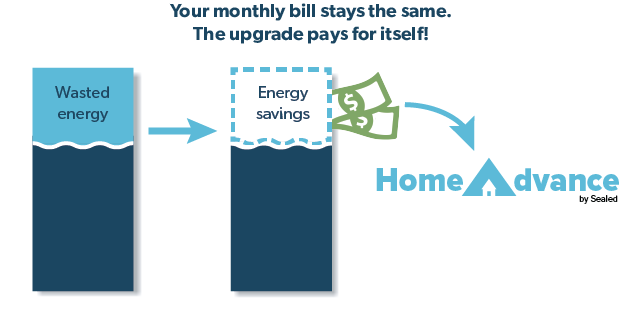 The energy (and money) you save each month covers the the upgrades and program costs. Your energy budget stays consistent with how it's been in the past, but your house is safer, greener, modern, and more comfortable. We look at your old energy bills, and how they were affected by things like energy prices and the weather. We can use that information to figure out how much you would’ve spent each month before making the upgrades. Then we look at your new bills, and calculate the difference. We will report your savings to you each month through your HomeAdvance Bill. Your payments will vary month-to-month depending on how much energy you're saving. For example, if you save 50 therms of gas in February, but only 35 therms in March, your payment will be larger in February. We will provide you a projected average monthly payment before your Welcome Call. The standard HomeAdvance term is 20 years, matching the lifespan of the upgrades we install. If you want to leave our program early, you may do so at any time by making an Early Payment. You may exit our program without penalty by making an Early Payment. This Early Payment decreases over time—the longer you stay in the program, the lower your Early Payment amount. Your HomeAdvance Agreement contains an Early Payment schedule which clearly lays out the details. If you move, you may transfer your agreement to the new homeowner or pay the remaining Early Payment amount. Terms and conditions for billing, Agreement cancellation, our responsibilities to you, etc. Billing with HomeAdvance is clear and easy. Each HomeAdvance bill will clearly report and keep track of how much energy your home has saved. Your HomeAdvance bills will arrive on the same cycle as your electricity and heating bills normally do. Rather than make multiple payments, your we combine your energy bill and HomeAdvance bill into one easy payment. All of our bills arrive by email and are paid through automatic direct debit five days later.